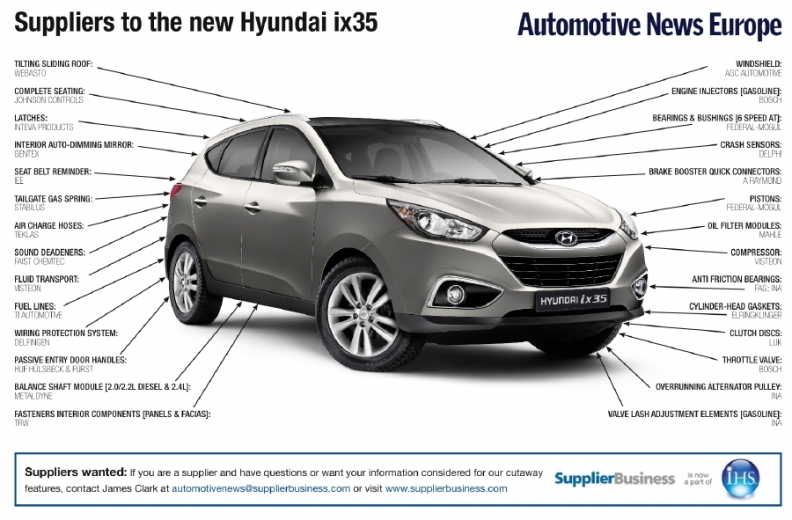 Federal-Mogul, Bosch win big with the new Hyundai ix35. Federal-Mogul and Robert Bosch have a number of key parts in the new Hyundai ix35. Along with the pistons, rings and bearings, Federal-Mogul provides bushings for the SUV's new six-speed automatic transmission. Bosch supplies the control unit and injectors for ix35's gasoline engines. The parts contribute to the overall efficiency of the ix35's gasoline powertrain, which when combined with a stop-start system offers CO2 emissions as low as 149 gram per kilometer. This is a big reduction from the CO2 low of 194g/km for the car the ix35 replaces, the Tucson. The ix35 scored five out of five stars in the EuroNCAP safety tests partially due to its seat belt reminder system from IEE. The supplier provides sensor mats in the driver's and front-passenger's seats that detect occupants and trigger an audible and visual warning to remind unbuckled occupants to fasten their seat belts. According to IEE, 80 percent of unbuckled occupants fasten their seat belts when alerted by a reminder system. The SUV gets its optional tilt/slide sunroof from Webasto while FAIST ChemTec GmbH provides 100 percent of the ix35's sound deadeners. The ix35 is produced at Hyundai's factory in Ostrava, Czech Republic, alongside the i30 and ix20. Output of the SUV began in July 2011. According to IHS Automotive forecasts, ix35 production is set to peak at 96,115 in 2012.